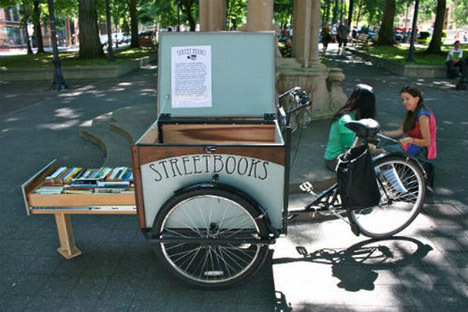 Artist, writer and now street librarian Laura Moulton runs the amazing Street Books project in Portland. Her library cart folds into a compact box that she pedal-pushes around town to loan out books to people on the streets. It reminds me of the library bus that used to come to a parking lot in a suburb on the outskirts of Toronto where I lived when I was nine years old. I loved that bus – waited for it in the parking lot every week. Whenever I climbed into the bus, I remember feeling huge anticipation and gratitude. Thanks to librarian and friend Lee Anne for sending this my way. This is so precious. Imagine finding them everywhere – the way we can find food vendors here and there….